Don’t let departing employees leave with valuable intellectual property. Use digital forensics in daily workflows before they resign and in exit interviews to prevent IP theft rather than potentially be involved in litigation after they’re gone. 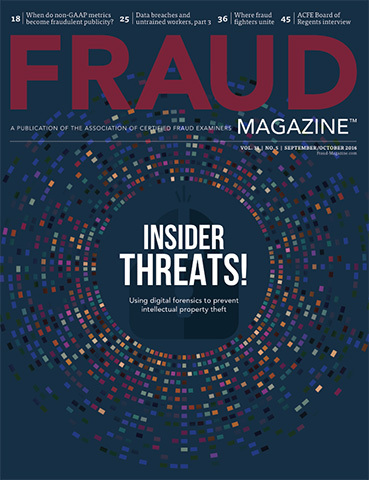 In one week in June, more than 3,000 fraud fighters met in Las Vegas to fill up their tanks and charge their batteries with hours of practical anti-fraud techniques and networking with peers. And to revel in their value to the anti-fraud profession. What happens when you fill a boardroom with highly intelligent people and ask them a few questions about fraud topics? You yield 90 minutes of insights that can’t be contained in one article. In this article, the Board of Regents discuss new frauds on the horizon, data breaches, new practices and training millennials as practitioners. Should you start an ACFE student chapter?